Check out our bulls for sale! Great selection of top bulls from great foundational cow families!!! 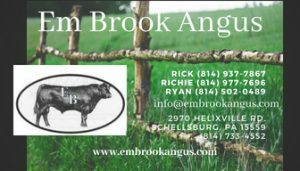 Em Brook Angus is a family owned and operated Angus farm that is located in the South Central part of Pennsylvania in the foothills of the Allegheny Mountains. Em Brook Angus is owned by Rick & Barb Emerick, along with their two sons Richie & wife Paula, Ryan & wife Elisabeth. To date, we have been blessed with six grandchildren. 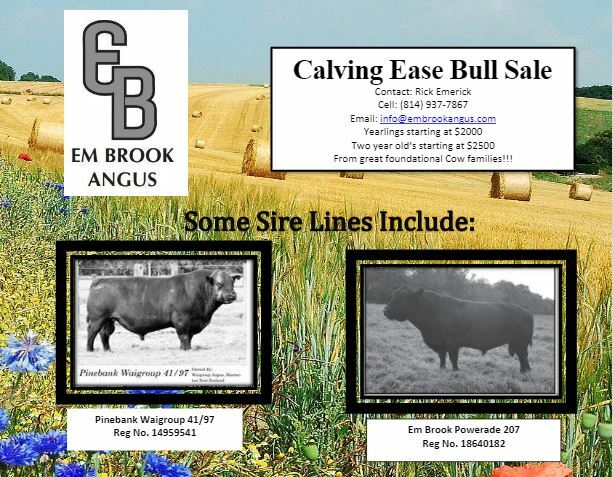 Em Brook Angus breeds purebred Angus cattle for the seed stock and commercial producers. We also have a farm direct freezer beef program. Our direct customers enjoy high quality grass fed beef with a natural finish.